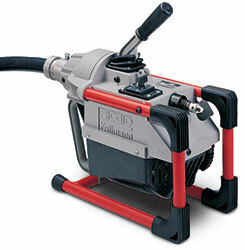 K-60SP Sectional Machines feature an adjustment knob for use with both 5/8" and 7/8" sectional cable. Includes: 75’ of 7/8" C-10 cable‚ A-8 cable carrier‚ A-1 mitt and a 7-piece tool set. Tool set includes: straight auger‚ funnel auger‚ retrieving auger‚ spade cutter‚ sharktooth cutter‚ pin key and toolbox. Cable size: 5/8" and 7/8"
Dimensions: 18" x 9-1/2" x 14"
Ridgid® C10 Standard Cable, 7/8" x 15’L, for K-60SP"